Playing together in its first game of the 2014 FIBA Americas U18 Championship, the USA Basketball Women’s U18 National Team (1-0) debuted with an impressive 104-55 win over Mexico (0-1) that saw five U.S. players finish in double-digit scoring as the team scored 84 of its points from the paint on Wednesday night at the U.S. Olympic Training Center in Colorado Springs, Colorado. Finishing with 16 points apiece were Jessica Shepard (Fremont H.S./Fremont, Neb.) and Brianna Turner (Manvel H.S/Pearland, Texas), who also grabbed seven rebounds; while A’ja Wilson (Heathwood Hall H.S./ Hopkins, S.C.) finished with a 15-point, 10-rebound double-double; Napheesa Collier (Incarnate Word Academy/O’Fallon, Mo.) added 10 points and eight rebounds; and Destinee Walker (Lake Highland Prep School/Ocoee, Fla.) scored 10 points. The USA took control of the game right from the tip off, and the first quarter saw the USA jump out to a 14-2 lead before Mexico fought back to cut it to 14-7 with a 3-pointer at 4:57. 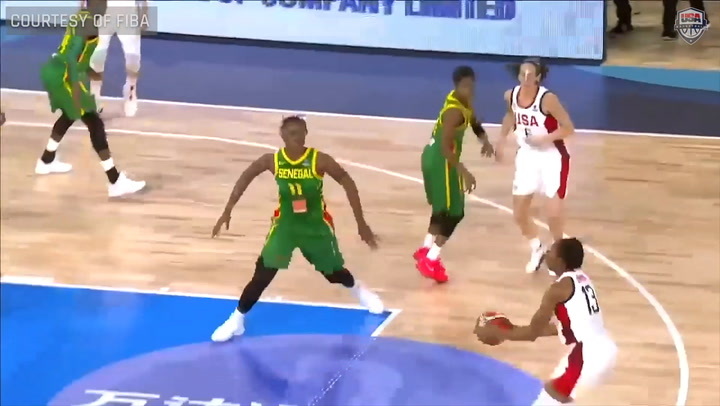 The USA closed the stanza with a 10-0 run to lead 26-10 at the first break. 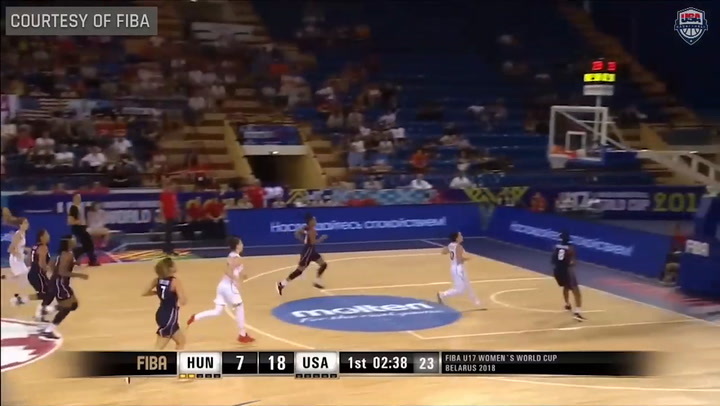 The run extended into the second quarter as the USA put up eight unanswered points to take a 34-10 advantage at 8:15 when Turner scored off of an assist from Receé Caldwell (Homeschooled/San Antonio, Texas). The 18-0 spurt was the USA’s largest run of the game. “I think our game plan was to get the ball inside and I think we did a good job of that and finishing,” Shepard said. Mexico ended its drought with a make from behind the arc, and then went on to make two more 3-pointers in the next two minutes to trail 38-21 at 4:56. The USA regained the game’s momentum form there, allowing just one more made three from Mexico while putting up nine points to lead 47-24 at the half. While eight U.S. scorers put up 32 points in the third quarter, including six points each from Collier and Beatrice Mompremier (Miami H.S./Miami, Fla.), the only place Mexico found some breathing room was from beyond the arc, scoring nine of its 16 third-period points from deep. Mexico made its last 3-pointer of the stanza with just .2 seconds remaining on the clock, and the teams headed into the final 10 minutes with the USA leading 79-40. 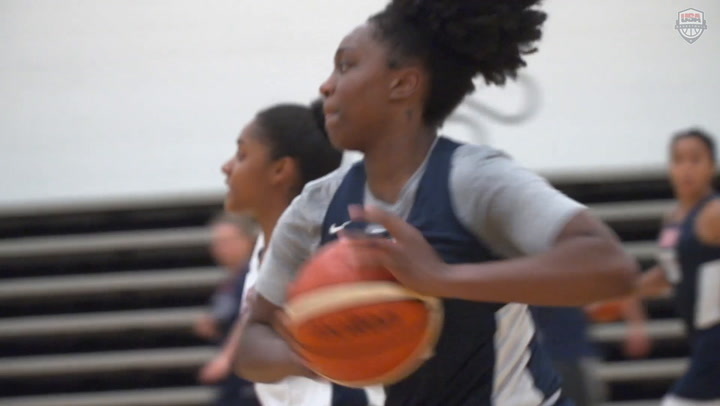 The USA never let up and compiled its largest lead of 49 points with its last score of the game, which came at 3.2 seconds from Ariel Atkins (Duncanville H.S./Duncanville, Texas), who finished with a game-high four steals. “When coach told us to get the ball inside, I looked more for the inside post players rather than a shot, and that helps for more buckets and definitely more momentum for our team,” said Marina Mabrey (Manasquan H.S./Manasquan, N.J.), who dished out a game-high six assists. The USA used its size advantage to outrebound Mexico 53-17, its depth to tally 55 points off of the bench and shared the ball to record 27 assists. The U.S. defense held Mexico to just 30.1 percent shooting from the field. Mexico was led by 15 points from Claudia Ramos. Also today, in Group B Argentina (1-0) beat Chile (0-1) 45-40 and Puerto Rico (1-0) downed Brazil (0-1) 64-57; while in the USA’s Group A, Canada (1-0) defeated El Salvador (0-1) 65-34. The USA will take on El Salvador at 5:30 p.m. on Aug. 7 and then wrap up its preliminary round against Canada at 5:30 p.m. on Aug. 8. Admission to the 2014 FIBA Americas U18 Championship is free, and all games will take place in Sports Center I at the U.S. Olympic Training Center. Following the preliminary round, the top two finishing teams from each group will meet in the semifinals on Aug. 9, with the winners meeting in the gold medal game on Aug. 10. The third and fourth-placed teams after the preliminary round will compete for fifth through eighth places, including consolation semifinals on Aug. 9 and classification games on Aug. 10. 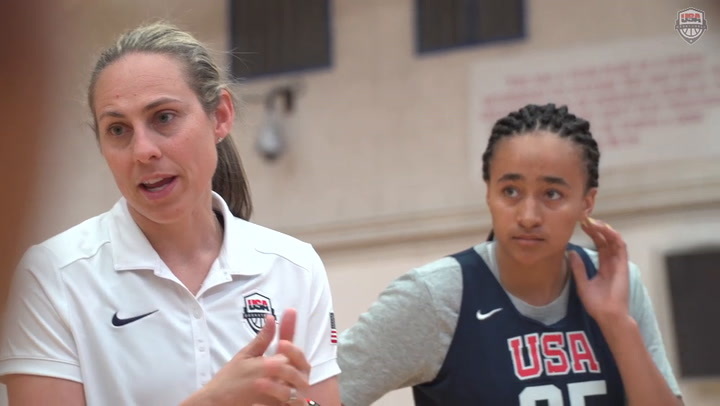 Staley, who also will serve this summer as an assistant coach for the 2014 USA Basketball Women’s World Championship Team, is joined on the sideline by USA assistant coaches Kim Barnes Arico (University of Michigan) and Jeff Walz (University of Louisville). The USA is looking for a seventh-straight gold medal at the 2014 FIBA Americas U18 Championship for Women, and is now 43-2 over all in the event since it was first held in 1988.